Are high strength square nuts readily available? Most square nuts in the marketplace are made from low or medium carbon steel and are typically used with square head bolts. Their strength is not compatible with high strength bolts. These nuts are readily available in plain finish and hot-dip galvanized and are typically mass produced overseas. If you are looking for high strength square nuts, SAE J995 Grade 5 can be found as plain finish and mass produced overseas. However, hot-dip galvanized, high strength square nuts are not readily available in the marketplace. If required, grade 5 square nuts can be galvanized. It is important to note that galvanizing square nuts also requires them to be tapped oversize. Other grades as well as any domestic material can be provided, but those will have to be made-to-order. 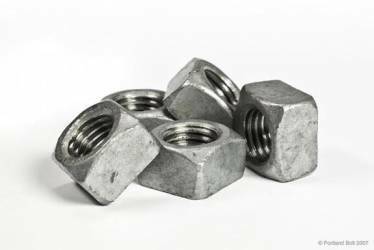 Unlike hex nuts, which are available as standard hex and heavy hex, there is only a standard pattern of square nuts with dimensions outlined under the ASME B18.2.2 specification. Heavy square nuts do not exist.